Deandre Harris faces felony charges after his well-publicized beating at the Charlottesville Unite the Right rally in August. Video footage posted to Twitter shows Harris getting beaten by protesters with shield and poles. The popularity of the footage led to two arrests. Two of those accused of involvement in the beating were arrested via social media identification, 18-year-old Daniel Borden of Cincinnati, Ohio, and 33-year-old Alex Ramos of Marietta, Georgia. The purpose of Unite the Right rally was for alt-right groups to gather in protest of the removal of a statue of Confederate Gen. Robert E. Lee. The day was marked by violence and chaos, and one death. A woman was killed when a man rammed a car through a crowd of counterprotesters. Harris now faces charges of unlawful wounding after someone from the rally approached the magistrate. The magistrate verified video footage with police and issued a warrant for Harris’s arrest. The victim has yet to be named. The exact circumstances of the charges have also not been released, reported the Huffington Post. Harris could be facing arrest for his role in scuffles that occurred before getting attacked. In other footage available online but less publicized in the media, Harris can be seen with a group of counterprotesters initiating an attack. One of the group grabs a Confederate flag, and Harris can be seen hitting the man in the head with a heavy duty black metal flashlight. That leads to a protester spraying tear gas at the group, and then a fight breaks out. 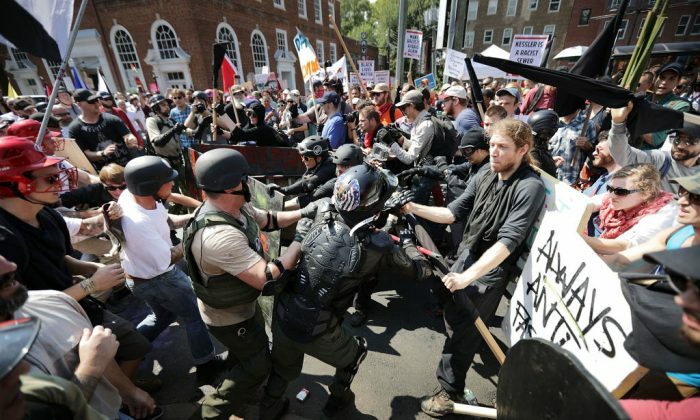 Ultimately the counterprotesters are outmatched by the pro-Confederate protesters, although the number of counterprotesters was large. Harris winds up coming out the worst, stumbling away with blood dripping from his head. In video footage that appears to have been taken before the clash, Harris can be seen clutching a metal flashlight in one hand and a short club in another. In another video, men in the group Harris is with can be seen arguing with a man who is upset about being called a racist because he is white. The man appears to be in support of the counterprotest. Harris’s attorney, Lee Merritt said the charges are retaliatory, but that his client will turn himself in, WCPO reported.